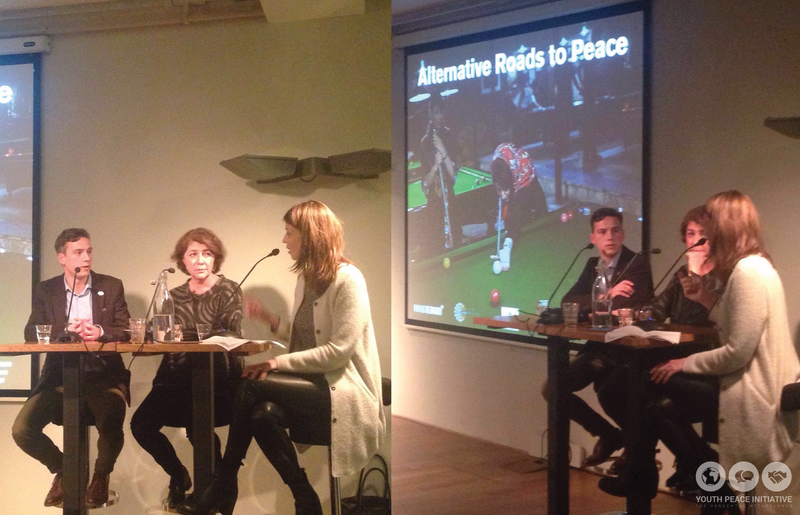 On Wednesday 6 April the Youth Peace Initiative co-organised a discussion evening together with Het Grote Midden-Oosten Platform on ‘Alternative Roads to Peace’ with a focus on Syria at Pakhuis de Zwijger in Amsterdam. The discussion was moderated by Petra Stienen, Middle-Eastern specialist and diplomat and winner of the Aletta Jacobs Emancipation Prize 2016. She started by interviewing Rafif Jouejati, Co-Founder and Director of the Foundation to Restore Equality and Education in Syria (FREE-Syria). Rafif elaborated on the goals and achievement of FREE-Syria. She explained that the organization tries to give Syrians a voice by means of the Freedom Charter. She sees civil society playing a crucial role in peace building and promotes gender equality in all its activities. Thed Brouwer, our Chairman, was also invited to join the discussion panel. He talked regarding about the work of YPI and the steps YPI is taking towards our new project on Syria.